The Boston Symphony Orchestra often succeeds in giving us gifts we appreciate deeply only in the course of later reflection. This was very much the case with this weekend’s three-concert density. At first glance, one must wonder what’s going to pull concertgoers into an apparently unrelated sammelsurium of works, led by a conductor still largely unfamiliar on these shores. The answer can best be found in the BSO program one is handed on entering Symphony Hall, or online among the BSO’s increasingly complete and satisfying annotations, bios, and so on. The specific evening in question was this past Thursday, January 13, when our rigorous winter was in fine, blustery form, and our streets and sidewalks were memorably uninviting. The sizable audience showed up mostly on time, which is enjoyably typical of the orchestra’s loyal, diverse live listenership. Our culture today requires more social interfacing than diving into the program book front to back, but there were still a fair number of bent heads to be observed as the folks on stage played in before they tuned. My own experience with the concert, once asked to write it up, began with a good read online, a casual reacquaintance with the Delius (BBC Symphony/Andrew Davis), and some surfing (via research-friendly Google.de) among the early-20th-century press clippings that chronicle how three of the four pieces were originally received. A glimmer of a reason for the unusually heterodox programming came out of this reading before the evening of the concert. I think this worth sharing, naturally with the proviso that a spokesperson for orchestra or conductor may be sufficiently amused or annoyed to point out the error of my conclusions. The four scores have in common that each of them appeared early enough in American concert life to significantly broaden, inform, and perhaps even change the way our ancestors, and therefore those whose perceptions kindled and directed our own early on, took in new music. I find this fact intriguing and challenging. For instance, we heard two of Debussy’s twenty-four piano Préludes — “Feuilles mortes,” Livre 2 (1912-13) and “Ce qu’a vu le vent d’ouest”, Livre 1 (1909-10) — played first as written, by Eifel-born pianist Lars Vogt, then attacca in brand-new, sumptuous orchestrations by British composer/arranger Colin Matthews. The original scores crossed to North America immediately on publication and, given their startlingly otherworldly timbral and harmonic language, instantly posed questions whose answers powerfully define points of departure for modern music. The full, darkly luminous orchestrations were irresistible. They cannot possibly top the piano scores, of course. Their manifest perfection and star-grasping sonic vocabulary came through even via the medium of the bland, cold Hamburg Steinway D grand Mr. Vogt played. I don’t imagine that either Matthews or conductor Sir Mark Elder (Hallé Orchestra, Manchester, UK) would have attempted this lovely juxtaposition if they’d felt there was the slightest chance that the might of brass, woodwinds, and percussion would “beat up on” the piano originals. Spanking new transcriptions of this delicacy and richness are uncommon. I could not help but float a mind’s-eye sketch of the two-hand skeleton on which they are based through the great, towering structure of each orchestrated Prélude as it swept slowly through Symphony Hall. The Matthews transcriptions are magnificent new gems. They also hew closely and with audible deference to the architecture and affect of their models. I can’t wait to encounter the remaining twenty-two of them. If the piano itself was unengaging, at least the soloist’s polished pianism managed to draw from it what was needed, while sinewy small ensembles within the band entrusted with orchestral lines and harmonic commentaries always knitted themselves into impeccable, deftly unified brush strokes that truly added up to the Picture. Turning the page to Delius, conductor and orchestra revived a work scarcely heard in Boston for a century, even though the BSO premiered it in North America in 1909. Paris: A Nocturne — The Song of a Great City (1899) did not particularly appeal to busy, businesslike Richard Strauss when the composer sent it to him for commentary, but it has enjoyed scattered popularity since its 1901 premiere by German conductor Hans Haym, the score’s dedicatee. In the big score, Delius, the perfect English expatriate, fondly remembers the Paris of his youth, a city whose youthful heart was consumed by the vibrant, frenetic Montmartre nightlife. Its newly cosmopolitan social climate (1890s) thrummed on for decades but was summarily snuffed out by the 1940 occupation. It’s a picture of what once was, back then, as we experience it now, but the old context of the great city remains clear and communicative. Elder delivered it to us with such deference to the admittedly superb overall ensemble effect that one could complain that nuance, lyricism, even finesse were left by the wayside. 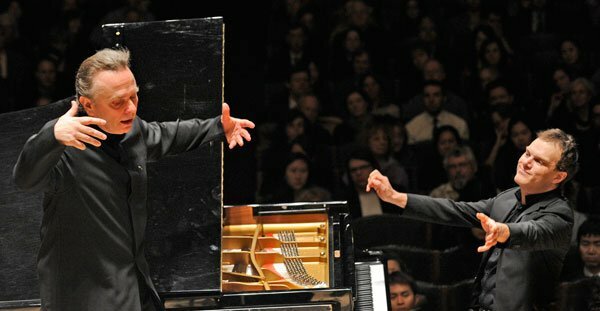 A Mozart piano concerto as a defining modern work? But of course. Whether one encountered the Emperor concerto in a matinée concert or one of those sparks-flying Anton Rubinstein concerti in an evening series concert, the format of the piano concerto was so well known by the building of Symphony Hall that it may have appeared incapable of returning or revision. What a surprise, then when the Theodore Thomas Orchestra and William Mason (not Lowell or Henry, of Mason & Hamlin fame) gave the first US reading of the Concerto in C, K.467, in 1876. They presumably offered mid-Romantic Boston a flower-fresh, urbanely conversational piece that eschewed the bombast often served up in concerto repertoire of that era. Herr Vogt speedily demonstrated both his elegant tone production and an irritatingly predictable habit of pouncing on phrase endings. The smaller orchestra onstage made for fine, appropriate balances, but the chill clangor of the nine-foot solo instrument now and again obscured delicate wind band comments or important lower string detail. The overall feel was of warmth and orchestral precision, though the smaller bits were unable to assert their intimate magic. Vogt played outer movement cadenzas whose brevity, sharp wit, and harmonic freedom were refreshing. Mr. Elder swaddled the first bars of Till Eulenspiegel’s lustige Streiche (“Merry Pranks”), Op. 29 (1895), in expansive, gentle layers of developing motives. His calm entry into the piece afforded an authentically Straussian launchpad for the ensuing high jinx and myriad of lyric episodes in the brief life of the eponymous scamp. The score’s printed title continues, “nach alter Schelmenweise in Rondeauform; für großes Orchester gesetzt” or, pretty freely, “a setting for large orchestra, in rondo form, of an old tale about a naughty lad.” Written programs for this tone poem and others of the ilk have whizzed in and out of fashion, but Michael Steinberg’s economical, informative notes give ample historical grounding for us to tack on what images and period-appropriate social commentary we wish. Yes, indeed, it does help to have these slightly firmer bits of rigging among which to clamber as the big, at times unwieldy vessel of the work makes its extremely charming way through brilliant waters teeming with brass reefs, hard-driven spray from the high woodwinds, and gentle zephyrs amongst the high and low strings. The BSO sounded simply superb, as did that ever-amazing hall. Christopher, although I do not share your exuberance about “ever-amazing” sound of the Symphony Hall, but I do concur that on Saturday BSO played Till Eulenspiegel extremely pleasant. It was with a good balance between orchestral brisk enthusiasm and Strauss’ seriousness – a rare quality where BSO frequently slips. I truly enjoyed it. I read your review with interest – particularly in relation to the Debussy/Matthews Preludes, which were created for the Halle and Sir Mark as part of Colin’s association with us. If you would like to hear the full recording of all 24 preludes (which have been recently released, and just been awarded a Diapason d’Or )I would be very happy to send them to you. My first impression of the Debussy/Matthews was that there was an entirely different feel to the orchestrated versions. But when I listened over the radio on Saturday, the contrast was not so striking. And a non-placid piece by Delius was a revelation. In the piano concerto, there were a couple of notes from the piano which Mr. Vogt played so softly that they did not even make it up to seat A 17 in the second balcony left, most notably the end of the last rising phrase in the second movement. Meanwhile, I’m still toying with the idea of going on Tuesday to have another go at the pieces I heard last Thursday for the first time and the beautiful Mozart concerto. But I may well skip the Strauss, as I did last week thanks to the lady to my left who exited after the Mozart, the clearing the way for me to leave without being the one who made the other people rise to let us by. Richard Strauss is apparently becoming a pet peeve, even though he is easier to take than Brahms. I really don’t want to hear “Till Eulenspiegel” again. Once again on Tuesday evening the quarter note F in the fourth bar from the end of the slow movement was inaudible (this time in the back row of the first balcony center). I checked a couple of online scores to make sure that I wasn’t misremembering, and both show it. I wonder if Mr. Vogt thinks there is an error in the scores or if he was just playing it too softly for such a large auditorium.